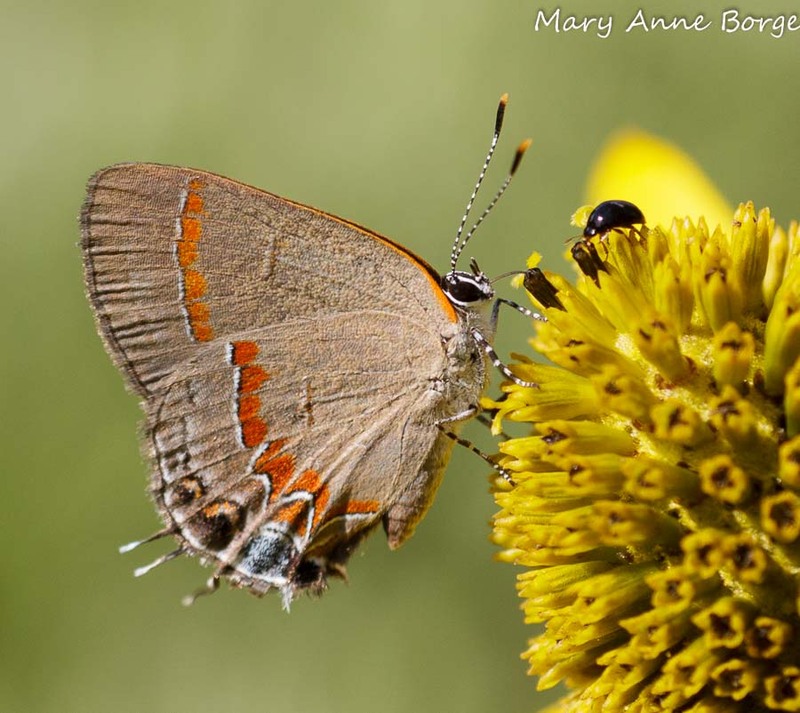 If you need any evidence to convince yourself of the nutritional value of leaf mulch, look to the Red-banded Hairstreak’s eating habits for confirmation. This small but showy butterfly, named for the wide slash of red across its wings, has a preference for leaf mulch as the food source for its caterpillars. By leaf mulch I mean naturally fallen, decomposing leaves. It is often referred to as leaf litter or detritus, terms that sound like something we should clean up or remove. Leaf mulch is such a valuable source of nutrients for both plants and animals, and such a good habitat for so many beneficial insects, that I’ve decide it needs a positive public relations campaign to make it socially acceptable to use naturally fallen leaves as a garden mulch. So I’m calling it what it is – leaf mulch. Join the movement! Adult Red-banded Hairstreaks nectar on a variety of flowers, including Mountain Mints (Pycnanthemum species), Goldenrods (Solidago species), Green-headed (or Cutleaf) and other coneflowers (Rudbeckia laciniata, Rudbeckia species), and even the flowers of sumac (Rhus species) trees. 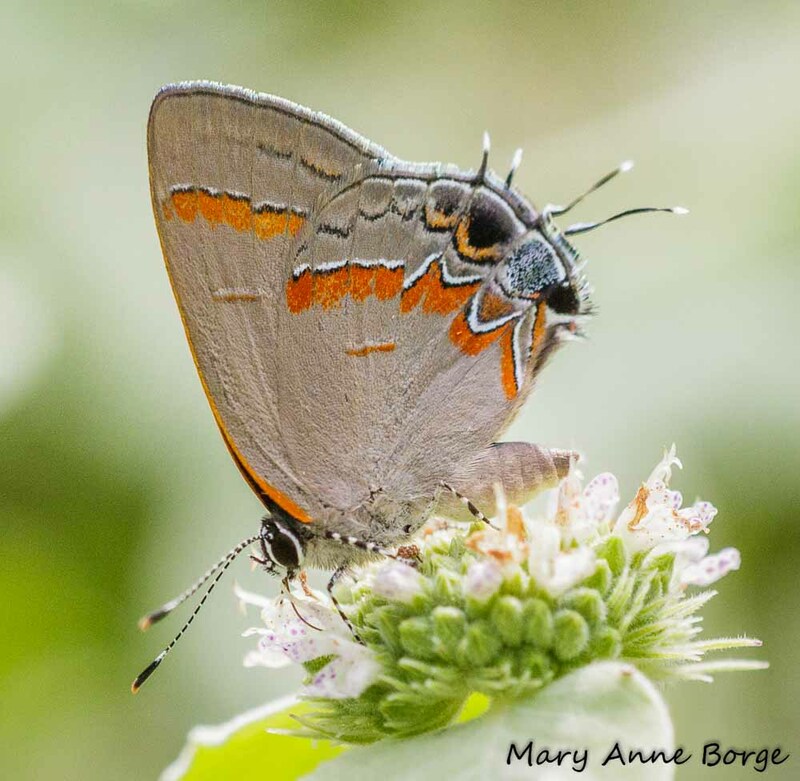 Red-banded Hairstreak caterpillars are reported to eat the fallen leaves of Wax Myrtle (Myrica cerifera) and other trees including oaks (Quercus species), but fallen sumac leaves are thought to be the favored hosts for this butterfly’s caterpillars. When laying their eggs (ovipositing) female Red-banded Hairstreaks walk on the ground, usually depositing eggs on the underside of fallen leaves. After they hatch, the caterpillars feed on the leaves. Red-banded Hairstreaks spend the winter as fourth instar caterpillars, likely in the shelter of this naturally fallen leaf mulch. 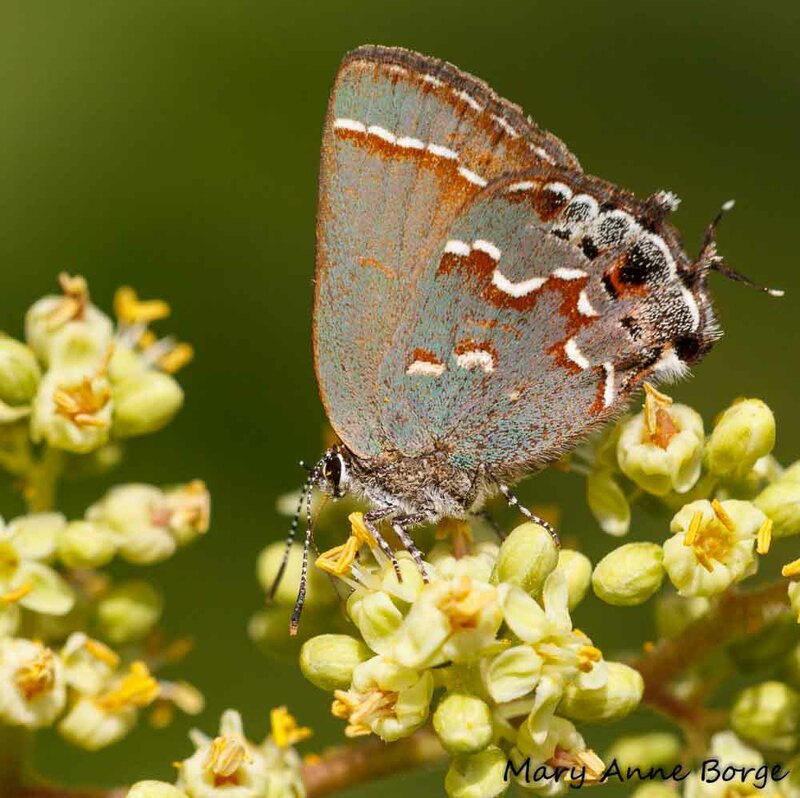 Winged Sumac (Rhus copallinum) is a favorite food source for Red-banded Hairstreak caterpillars. It’s also a good choice as an ornamental shrub, because it has glossy deep green compound leaves with a ‘winged’ midrib that gives this species its name. Its large pyramid-shaped clusters of yellowish flowers bloom in mid to late summer. 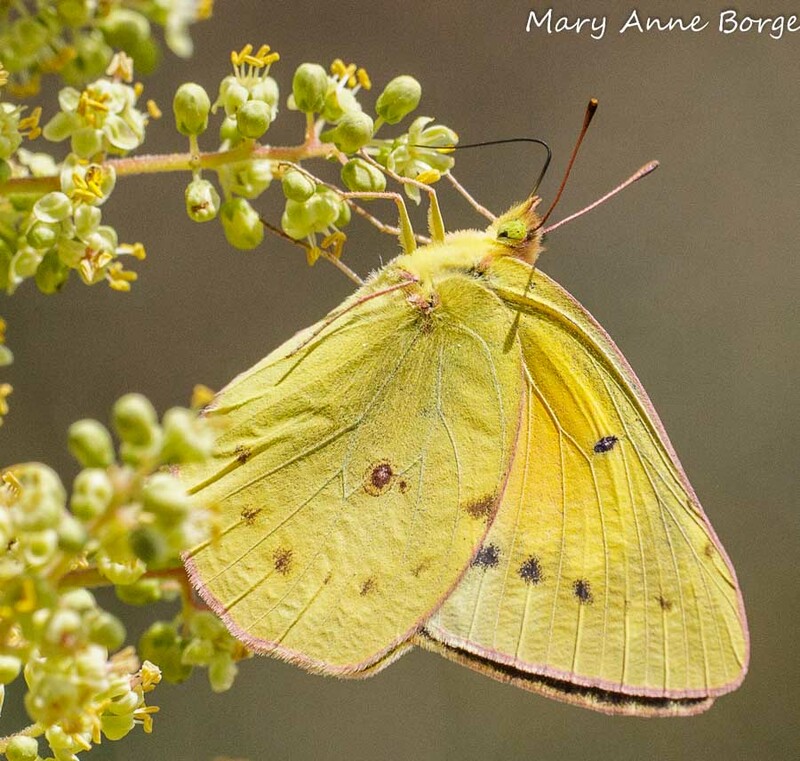 They are attractive to many insect pollinators, including butterflies. Successfully pollinated flowers yield bright red fruit that is complemented by dark red foliage in fall. 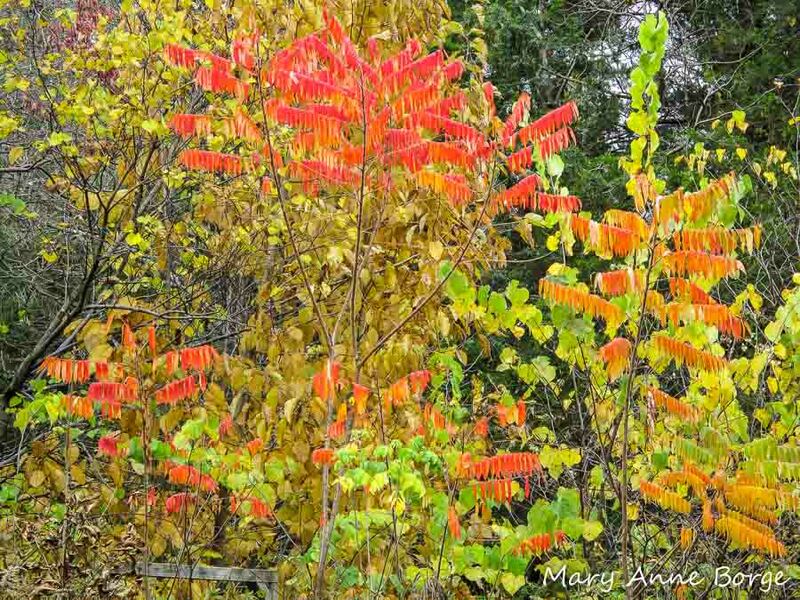 Winged Sumac grows to a maximum height of about 10 feet (3 meters), and prefers sunny locations. 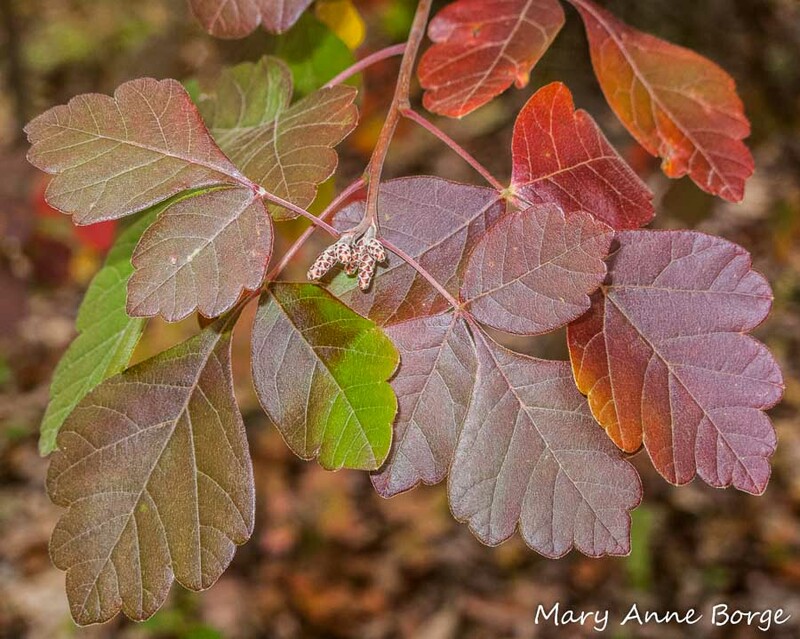 Fragrant Sumac (Rhus aromatica) is another attractive shrub that grows to a height of about 8 feet (2.5 meters) with glossy blue-green three-parted leaves that are somewhat aromatic. It blooms in spring before or concurrently with its leaves unfurling, has brightly colored fall foliage, and red fruit. It can tolerate sun to part shade. 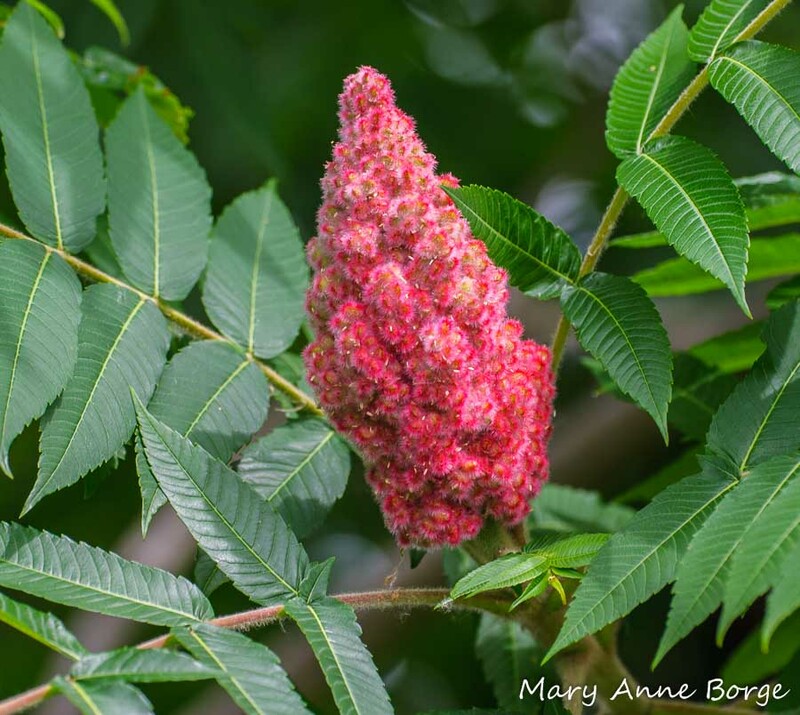 Staghorn Sumac is (Rhus typhina) taller, with a maximum height of about 25-33 feet (7.5-10 meters), beautiful fall color that begins to show in late summer, and bright red fruit clusters. It has large clusters of yellowish flowers that generally bloom in June. With sumacs, male and female flowers are usually, although not always, on separate plants, so to get fruit make sure you have a male as well as females. According to the USDA, several mammals and over 300 species of birds eat the fruit, although usually not until late in the winter, so you’ll be able to see their luscious bright red color for a long time. 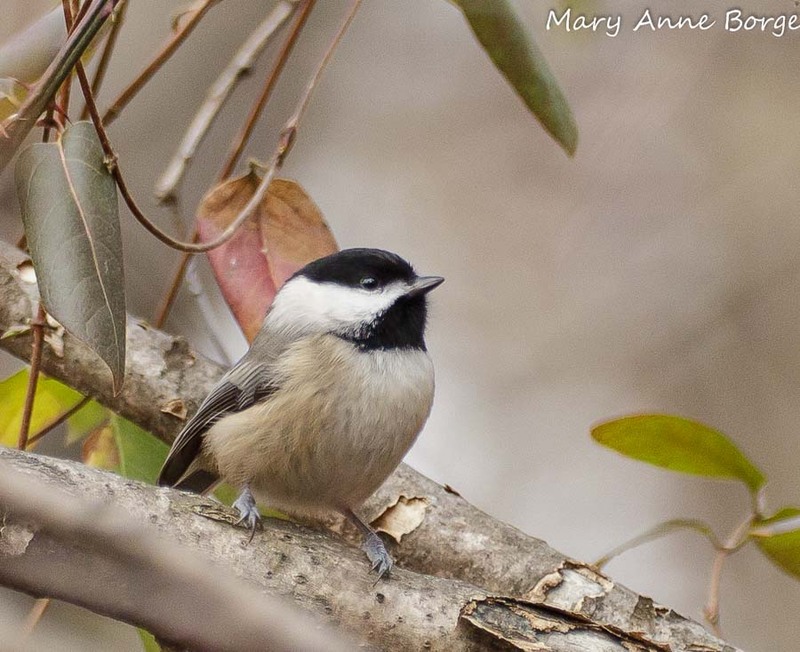 Among the birds I’ve seen eating the fruits are Chickadees, Downy and Pileated Woodpeckers. When established, sumacs may also spread through their underground root system. 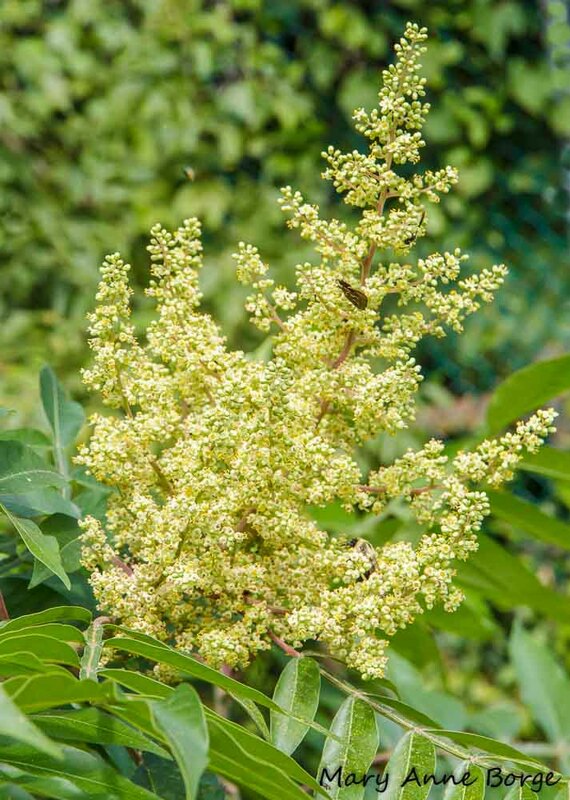 If you are considering a plant screening or hedgerow, consider Winged Sumac. It spreads quickly, and is quite lovely. Are you thinking, “Sumacs? Won’t I get a rash from them? Aren’t they poison?” No! 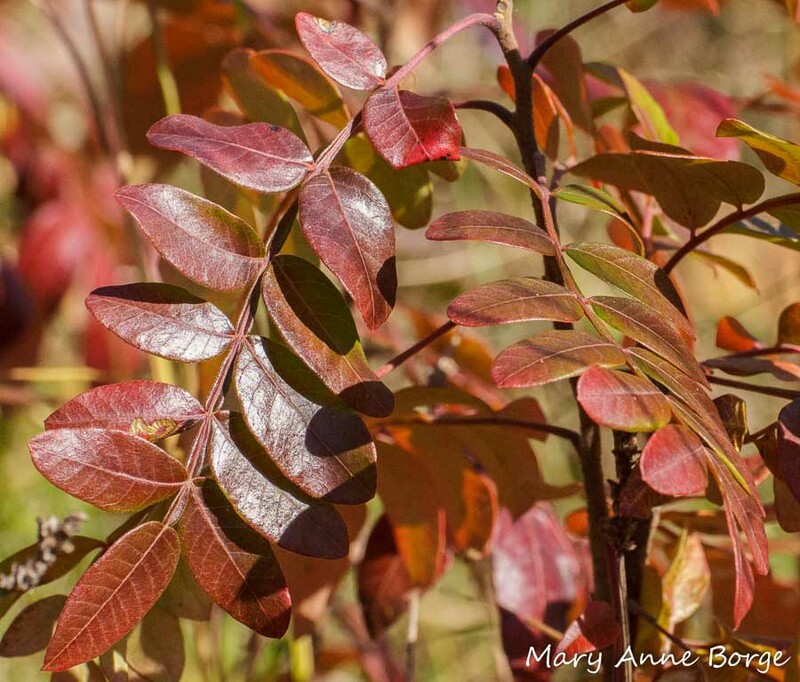 Only the related species, Poison Sumac (Toxicodendron vernix), has the chemical composition to give you a rash. Poison Sumac is actually more closely related to Poison Ivy (Toxicodendron radicans) than it is to the other sumacs. Even these two ‘poison’ plants have wildlife value in the food offered by their flowers and fruits! But they’re usually not recommended as garden plants. Let the naturally fallen leaves stay in the planting beds. I like option 3. What about you? To entice Red-banded Hairstreaks to take up residency with you, consider adding sumacs to your landscape. For a healthy garden, use leaf mulch. 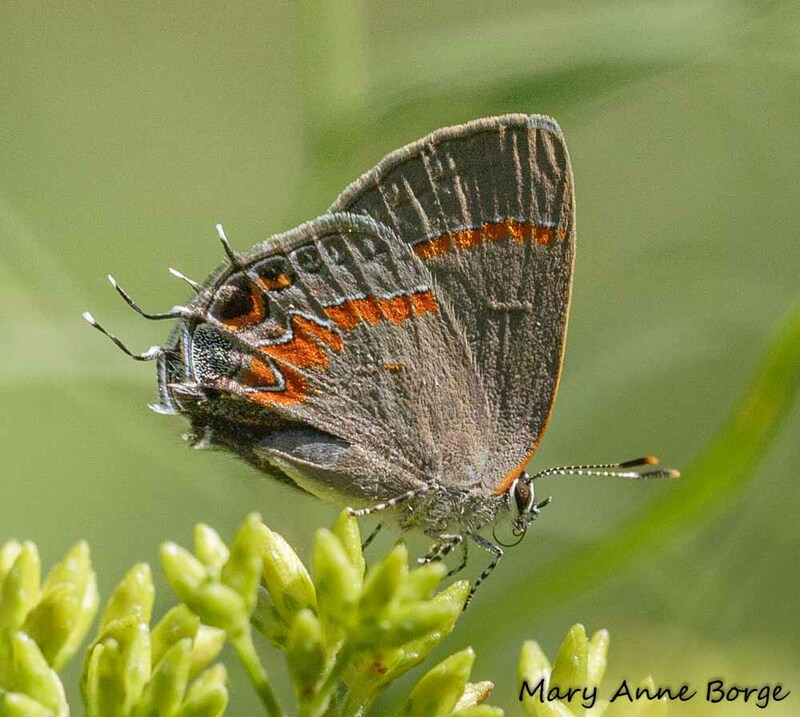 To enable Red-banded Hairstreaks to successfully reproduce and survive the winter, let the naturally fallen leaves be your mulch. 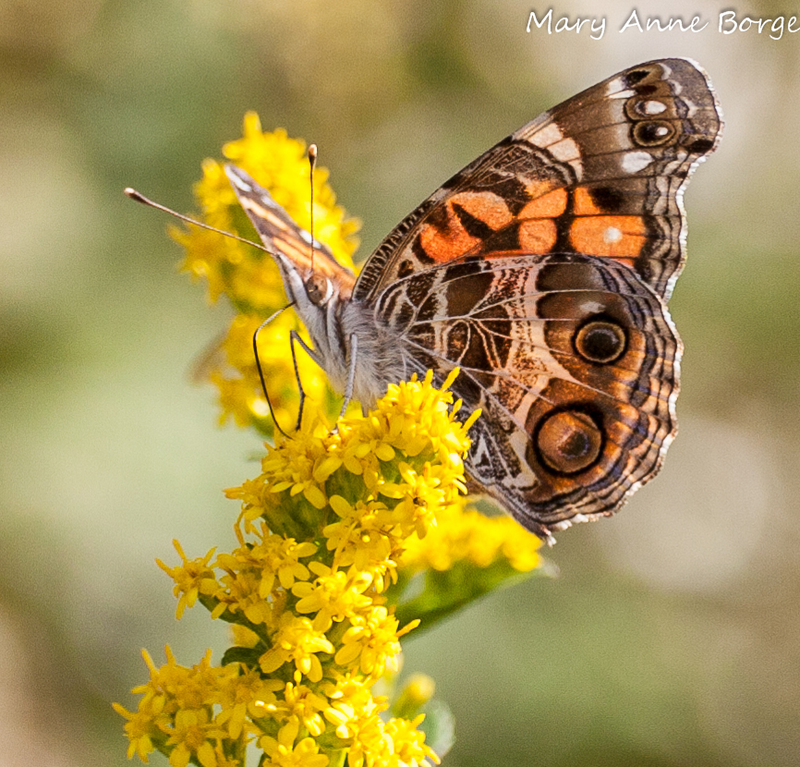 Note: This post was adapted from an article that appeared in the Fall 2013 issue of Butterfly Gardener, a publication of the North American Butterfly Association. Fall allergies? Don’t blame Goldenrod! If that’s what you think, you would be wrong.